Mike Warth was 16-years-old when he created his first game. Warth and his friend Rich Caldwell flipped over two ping pong tables, drew a map with markers — outlining land and sea areas — gathered up game pieces, used a ruler for weapon ranges and typed up rules. Today, Warth, is still having fun playing games, but he and his team at Flatworks Gaming, LLC, in Alexandria, are designing and selling them too. Since 2014, Flatworks creates and publishes board, card and dice games for the tabletop gaming industry. And based on the market, they’re on to something. Tabletop games are having quite the renaissance — and a profitable one at that. In 2014, the hobby game market totaled $880 million in retail. Break that down and the collectible games category is by far the largest, at $550 million. Miniatures and hobby board games were tied for second at $125 million each. Hobby card and dice games were $55 million, and role-playing games (RPGs) at $25 million. The collectible card game, Magic: The Gathering, brought in an estimated $200 million in 2014. Actor Wil Wheaton ramped up the interest with his web series on the Geek & Sundry network called “TableTop.” The show features Wheaton and other celebrities playing board games. The popular production is on its fourth season. About five years ago, Warth had the idea of using hex tiles for a game board. He would use the space between the tiles to build things, and, where the hexes came together were to be roads. The hex tiles were to be resources. With the growth of the Internet, and a little research, he found resources that listed other games. It didn’t take him long to find a game that was similar to the one he wanted to do. It was called Catan. As of 2015, Catan (or, Settlers of Catan in older versions) has sold more than 22 million copies in 30 languages. “It was at this point I told myself, I need to follow this dream of mine to become a game designer and publisher,” says Warth. So, he called up his friend Charlie Sinning and said, “Let’s start a business making games.” Longtime friend Craig Blythe was on board too. “It wasn’t until Mike approached me with the idea of starting Flatworks Gaming that I began to think of traditional table top game design for myself,” says Sinning. But game design, says Sinning, is a little different for everyone. He doesn’t follow the same design path that Warth and Blythe use. After the first play through, he says, it’s just a matter of going through the iteration process until you find you have a fun, balanced game. At the halfway mark the game is usually good enough to start getting other play testers involved. This, he says, is important feedback and can indicate if the game is really good enough to spend money on the artwork or not worth further development. Blythe, who says he has always loved games believe they can provide important means to spur the imagination and creativity. Warth says Flatworks wanted to start with easy, simple to understand games that can be played with families. “Charlie, Craig and I want to come up with games that are unique and we want to set a trend, to be leaders and not followers of any particular trend,” says Warth. While they watch and understand what is going on in the hobby market industry, they’re not inclined to jump on board with a fad. Their games include Squadron Dice, where players command squadrons of bi-planes in a head-to-head dice game; Pedwar, where players compete using cards to collect sequences and sets of object card to gain points; and King’s Tournament, a light card game where two players “joust” and “melee” as knights, were showcased at their first convention, CincyCon 2016, in March. The Flatworks team attended CincyCon 2016 at the Butler County Fair Grounds. More than 800 people attended the convention. Warth points out that ‘gaming culture,’ is a very broad term. After all, he says, people have been inventing games for thousands of years with mainstream games such as, Monopoly, Operation, Twister, Candy Land, Risk, Apples to Apples and Pictionary. Mainstream games, says Warth, tend to be less complex and focused to the casual gamer, while the hobby games – games like Catan and Pandemic – are just as fun but have more depth of play. Another interesting thing that’s happening, says Warth, are board game cafes. Similar bars and cafes, he says, have seen success in Toronto, New York City, Beijing and Berlin. Local libraries are also becoming a gathering spot for gamers. Clara Gerner, adult and teen services librarian for the Cold Spring Branch of the Campbell County Public Library, and adult and teen programmer, Deanna Pina, organize the library’s table top game program and are well aware of the growing interest in board games. 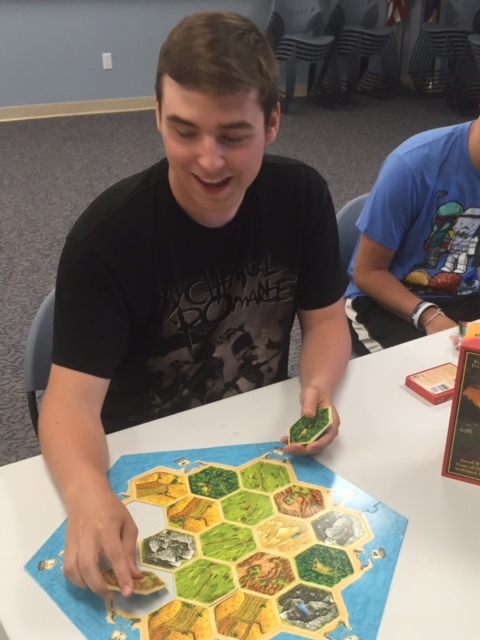 The library hosts regular tabletop game nights for teens, adults and families. Gerner says the monthly tabletop night that’s geared toward teenagers can have between 20 and 40 people in attendance. Gerner and Pina keep the shelves well stocked with favorites that include games such as Red Dragon Inn, Pandemic and Catan. Pina says she’s noticed that teens increasingly prefer to play the board games over video or digital games. “I guess now there are so many different games and I think they’re more creative. They get to have a lot of input on what happens,” says Pina. The big news about the tabletop gaming renaissance may well be that people – children, teenagers and adults – are gathering around tables, talking and strategizing together to come up with solutions to win the game. For 17-year-old Simon Boschert, the strategy has strong appeal. “Basically, my parents always had board games as a kids. We would play a lot – once a week or so,” says Boschert. He says he stopped playing for a while when he was in elementary school but resumed playing when he was 11-years-old and attended library game nights. For Blythe, a longtime game-player, and now, game-maker, a good game is one that stays with you and leaves you waiting for the next round.